Students’ boats, created with the help of sculptor Jeff Olson. Photo by Suzi Hass. 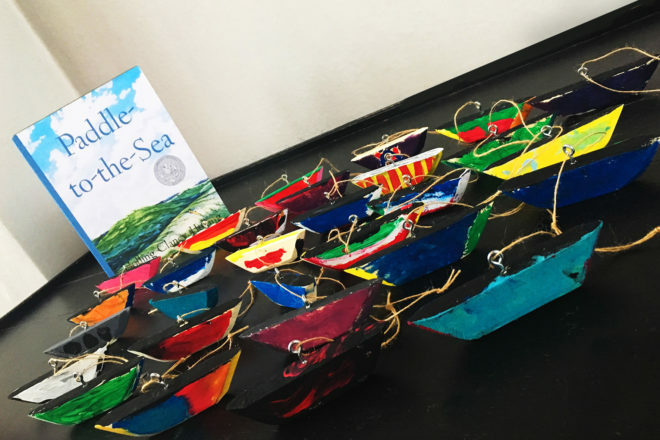 In conjunction with the upcoming Winter Water Fest at Door Community Auditorium (DCA), Door County sculptor Jeff Olson helped Gibraltar Elementary School students create wooden boats, which are currently on display in DCA’s Link Gallery of Children’s Art. Olson, who lives in Egg Harbor but shows his work nationally (including appearances on Good Morning America and the Today Show to discuss the art of snow sculpture), donated his time to help Gibraltar second-graders create the wooden boats. Olson carved the boats himself, then worked with the Friends of Gibraltar and Gibraltar art teacher Karla Donohue to help students sand and paint the boats in their art class. Olson also conducted a carving demonstration for the second-graders. The wooden boats created by Olson and Gibraltar students tie in to Paddle to the Sea, a Caldecott Honor book that was made into an Academy Award-nominated short film. The book and film form the backbone of Grammy-winning Chicago ensemble Third Coast Percussion’s performance at DCA on Feb. 1. Paddle to the Sea tells the story of a native Canadian boy who carves a wooden figure called Paddle-to-the-Sea who sets him on a journey through all five Great Lakes and the St. Lawrence Seaway en route to the Atlantic Ocean. The Link Gallery of Children’s Art is located at DCA, 3926 Hwy 42, Fish Creek. Third Coast Percussion tickets are available at the DCA box office, which is open 12-5 pm, Monday through Friday; by calling 920.868.2728; or online at dcauditorium.org.